Create Gantt charts with one single click. Choose one or even multiple projects at the same time and Ganttify does the rest. Update deadlines, milestones and time blocks right within the chart. Simply sign up and get started. Up to date Gantt charts of your projects. See how all your activities relate in time, find bottlenecks and explain your plans to others. Update planning, customize chart, zoom in and out or export as PDF/image. It's super easy. Ganttify generates the Gantt chart for you. 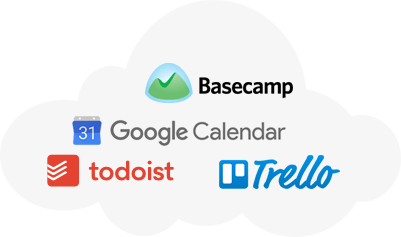 Authorize Ganttify to connect to your Basecamp, Trello or Google Calendar account by clicking one of the connect buttons above. From the project list, select one or more project from which you want to generate a Gantt chart. 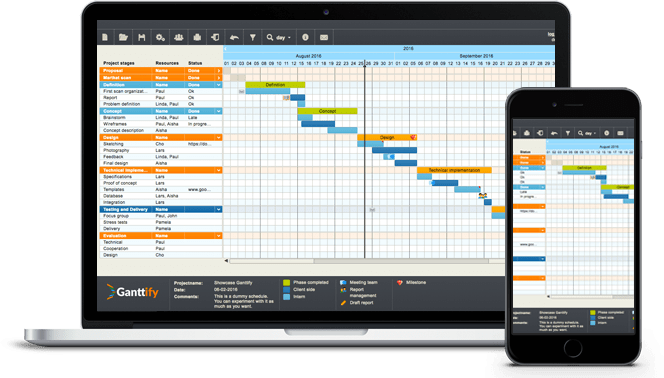 Ganttify interprets your project data and generates a Gantt chart from your Basecamp, Trello or Google Calendar projects. 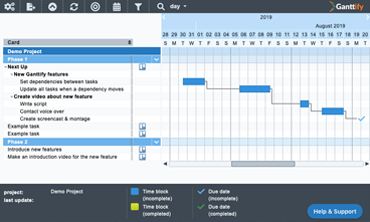 Edit your timelines right from the Gantt chart interface, export it as a PDF or image, or share the online Gantt chart with friends and colleagues. Extensively covered by the press. Once that is taken care of, a gantt chart can easily be created by clicking the button next to the calendar you want to transform. As well as viewing it on screen, the charts can be exported in picture or PDF format, making them easy to embed in other documents. Used by more than 645.354 people all over the world. While it doesn’t have all the advanced features offered by its competitors, it’s well-designed and simple, which makes it really easy to use, even for complete project management novices. It's attractive because it actually makes a multi-colored, horizontal time chart the primary interface for project management rather than an extra something you can print or look at on the side. You can make modifications on the fly; right-click to create a new period in your project plan, then select a color, and you've already gotten started. You can drag and drop periods around the chart easily — impressive for a web app. Tom's Planner has launched their dead-simple web-based project management and planning system lets users create and visualize an online planning schedule. 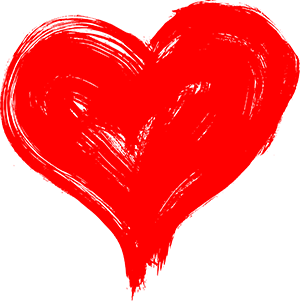 The application is meant to be used by a broad spectrum of consumers, from project managers, event and wedding planners to busy soccer moms or personal assistants.